Replacing or supplementing standard forced-air heating with a silent, energy-efficient baseboard system could be a relief to both your allergies and your wallet. Read on to determine if this upgrade is right for you. In this day and age, with our access to new, energy-efficient technologies, home heating shouldn’t have to cost an arm and a leg or disrupt the peace and quiet of a cozy home. For many homeowners, the ideal package—heat that is quiet, affordable, and low maintenance—may be best achieved by the installation of baseboard heaters. Modern baseboard heaters can offer a convenient and cost-effective supplement, even alternative, to the forced-air heating systems used in the majority of homes in America. Baseboard options include systems that are suitable for whole-home heating as well as those used only to supply or supplement heat in stubbornly cold rooms. The best choice for any particular installation depends on the heating needs and the design of the house. Keep reading to learn how to navigate the many baseboard heating options on the market today—electric, hydronic, electric-hydronic hybrids, and portable units—in order to choose the best fit for your home. Baseboard heaters supply heat via either a hydronic, fluid-based system or an electric system, both of which provide several key advantages over traditional forced-air heating. Topping the list of pros is the fact that, involving neither blowers nor ducts, baseboard units operate in virtual silence. Plus, whereas forced-air systems often collect and distribute airborne particles like dust and other allergens, baseboard heating does nothing to detract from indoor air quality. “Another positive from not having ductwork comes in the form of a baseboard system’s unobtrusive footprint,” says Daniel O’Brian, a technical expert at online retailer SupplyHouse.com. The system’s design allows you to fit components along the base of the walls instead of having to run ductwork throughout the home, making installation easier, minimizing maintenance, and allowing a little more control over placement. The absence of the extensive remodeling required to accommodate ductwork makes baseboard heat particularly appropriate (and easy!) for older, architecturally sensitive homes. With so many types of baseboard heating available on the market, your decision will primarily come down to power source, with secondary consideration given to the amount of space you’re trying to heat. Electric baseboards use a direct electrical connection to produce heat. Typically hardwired into the circuitry of the home with either a 120-volt or 240-volt supply, this type of baseboard heater doesn’t require a furnace, boiler, or any other additional equipment. Operationally, electric baseboards depend on convection: The unit pulls cooler air in through a vent. 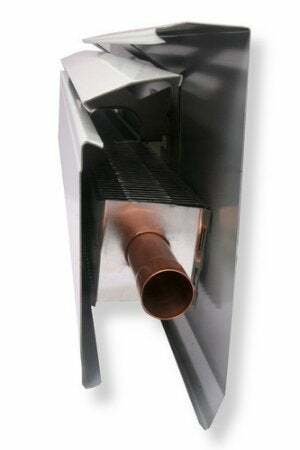 A series of metal fins connected to a heating element warm the air, which then rises back into the room. Though effective—and often quite easy to install—such units are rarely cheap to run, owing to the high price of electricity in many regions across of the country. For that reason, electric baseboards from leading brands like QMark and Cadet are best reserved not for whole-home use, but for supplemental heat in rooms underserved by the primary heating system. Hydronic baseboard heaters use a slightly more complex system, in which a boiler heats water (or, in areas prone to power loss and lower temperatures, a combination of propylene glycol antifreeze and water) and pumps it to the baseboard units, which emit heat into the room. Traditionally, these systems operate at 180° Fahrenheit to achieve a comfortable level of warmth in the home, but fuel-efficient boilers that can achieve the same level of heating while working at lower temperatures are gaining popularity. Because the fluid in the pipes of a hydronic system retains heat better than the metal fins of an electric baseboard, hydronic systems are more energy efficient, which makes premium brands such as Slant/Fin and Runtal more attractive for whole-house heating. While both electric and hydronic systems heat effectively, each type has its clear forte: Electric baseboards serve better as smaller-space heating sources or for supplemental heat in a larger room, while hydronic baseboards are more fuel-efficient, depending on electricity costs in the area. Selecting a baseboard heater of the right type, size, and heating capacity depends on the square footage and heating requirements of the space in question. Other factors to consider are the location of the room, the type and amount of insulation, and the typical number of people using the room. To help narrow your search, SupplyHouse.com created a calculator that estimates the target heating capacity for any unit, expressed in British thermal units (BTUs), based on your location’s climate and space’s square footage. Once you’ve found a model that will satisfy your heating needs, you’ll need to figure out how to install it. Most one-room, portable baseboard heating installations are simple enough for a handy homeowner to tackle. With hardwired or whole-house systems, however, you may want to call in a contractor for at least part of the job. “Boiler hookup and electrical wiring are best performed by licensed professionals,” notes O’Brian, but homeowners can certainly attach the baseboard covers, which maximize and direct airflow, protect family members from the hot pipes, and shield the heating elements; covers may be included with the system or sold separately. Those from Baseboarders require no tools to install and can be used to refresh the look of older, ugly hydronic baseboard heaters—an uncomplicated finishing touch for an already easy and energy-efficient home upgrade.